Pablo Sosa has been honored by The Hymn Society in the United States and Canada (THS) at its annual conference in St. Louis, Missouri, July 16, 2018, by being named a Fellow of The Hymn Society. This award, the highest honor given by the organization, was conferred because of Sosa’s work as a composer, professor, choral conductor, practitioner of church music, and advocate for the inclusion of global hymnody in the church’s song worldwide. Born in Argentina in 1933, Sosa resides in Buenos Aires. A Methodist pastor, he studied theology at the Instituto Universitario ISEDET (Buenos Aires) and church music at Westminster Choir College (Princeton), the Hochsule für Musik (Berlin) and Union Theological Seminary’s School of Sacred Music (New York). Emeritus professor of Liturgy and Hymnology at ISEDET, he also taught Choral Conducting at the National State Conservatory in Buenos Aires for thirty years. 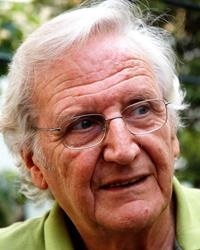 In 1972 he founded the musical ensemble ‘Música para Todos, (Music for Everybody) directing and conducting it until 2003. Sosa has edited several hymnals and cancioneros (song books) including Cancionero Abierto (Open Songbook, 5 vol. between 1974 and1990), and Canto y Fe de América Latina (2005) in collaboration with Inke Frosh from the Evangelical Church del Río de la Plata. Most of his songs explore folk music genres from Latin America, and among the best known of his compositions are ‘El cielo canta alegria’ (1958); ‘Cristo Vive’(1960); ‘Si fui motivo de dolor’ (1960); ‘Miren qué bueno’ (Psalm 133 – 1970); ‘Gloria’ (1978); ‘La bendición del Dios de Sara’ (1988); ‘Este momento en punto’ (1990) and more recently “Que esta Iglesia sea un árbol” (May this church be like a tree), premiered at the World Council of Churches’ General Assembly in Busan, Korea, 2013. His hymns have been included in hymnals and song books around the world and translated into various languages, including Japanese, Chinese, Swedish, Portuguese, German, English and Finnish. In his work composing songs, leading choirs, editing hymnals, producing religious broadcasts, and teaching liturgy and hymnology at a seminary, Sosa has been a tireless advocate for the inclusion of global hymnody in churches worldwide. He was a major contributor to Jesus Christ, the Life of the World (1983), the songbook of the 6th Assembly of the World Council of Churches in Vancouver and was one of its song enliveners. In 2003 GIA Publications edited Este es el Día / This is the Day, a CD and song-book with nineteen of his songs, and in 2007, Sosa, a member of the Global Praise Working Group, of the United Methodist Church, wrote Un Canto de Libertad (A Song of Freedom) a guide for the study of the missionary movement through its songs. A recording of 29 of his songs written in the last fifteen years is about to be released in Buenos Aires, with the participation of a number of distinguished Argentine musicians.